DEC and partners host three annual Winter Weekend events at Camp Santanoni, providing a rare opportunity during the season to see inside the buildings at this historic great camp. The remaining winter weekends will be held February 16-18 (Presidents’ Day weekend) and March 16-17. For those who don’t have their own snowshoes, the Adirondack Interpretive Center (AIC) loans snowshoes for free at the Gate Lodge. 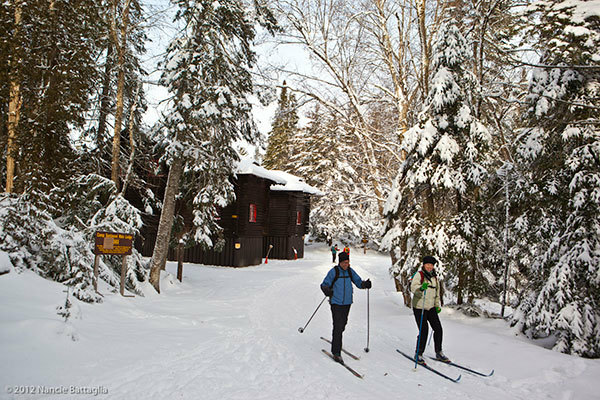 Camp Santanoni offers a 9.8-mile round-trip cross-country ski excursion. It begins at the Gate Lodge Complex and goes to the remote lakeside Main Camp Complex. Skiers and snowshoers can visit both lodges, view displays about Camp Santanoni, and take interpretive tours with Adirondack Architectural Heritage staff. The Artist’s Studio, a stone building near the main lodge on the shores of Newcomb Lake, will be open as a warming hut. Visitors are encouraged to bring their own cups for complimentary coffee, tea or hot chocolate while enjoying the lodge’s wood stove. A half-mile trail connects Camp Santanoni to the nearby AIC’s 3.6-mile trail system. On event weekends, the center’s buildings are open from 10 a.m. to 4 p.m.